(RAFI) Ramon Aboitiz Foundation, Inc. has launched the 5th Ramon Aboitiz Foundation Triennial Awards for the Visayas and Mindanao at Casa Gorordo Museum, Parian, Cebu City last December 3, 2009. The Triennial Awards honors those who become instrument in changing the lives of the less-privileged. The Triennial Awards started since 1996 to commemorate the 30th anniversary of the founding of RAFI in 1966. 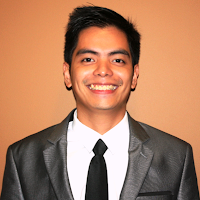 And because majority of the awards given in the Philippines have gone to individuals and organizations based in Luzon, RAFI focuses to the Visayas and Mindanao regions where many outstanding individuals and organizations should also be recognized, rewarded, promoted and acknowledged in the visayas and mindanao. The Triennial Awards for exemplary individual and outstanding institution in the Visayas and Mindanao, is an initiative of the Ramon Aboitiz Foundation Inc. to recognize noteworthy individuals & institutions and to encourage them who through their efforts that bring about hope and change for the betterment of the lives of the less privileged--reflect the philanthropic, humanitarian and holistic ideals of Don Ramon and Don Eduardo Aboitiz. It is truly inspiring to hear the achievements of exemplary individuals and their best practices. I was there during the 4th Triennial Awards: Leaders of Change Summit which showcased the nominees and showed their efforts in various break-out sessions throughout the day. 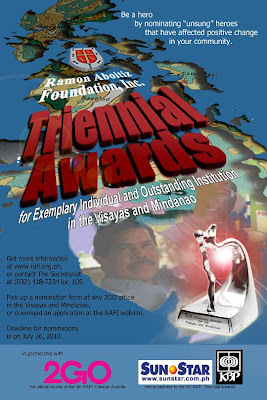 Deadline of nomination is on July 16, 2010 and you may download the the form onf RAFI-Triennial Awards Webpage. 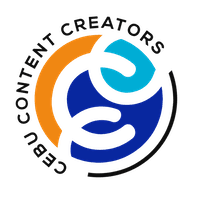 See you in the 5th Triennial Awards Summit in 2010!